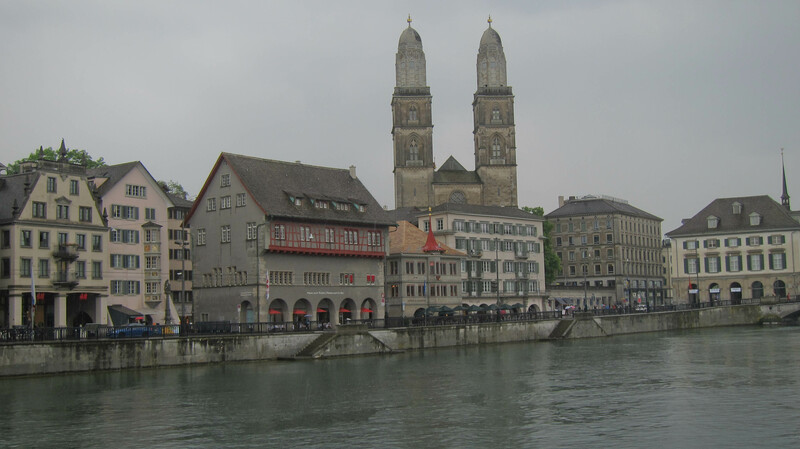 Zurich was our last destination before our 17 hour journey home. Everything worked out perfectly for our drive from Colmar to Zurich. We stayed at a hotel close to the airport for one night. We returned our car and decided to take the train into the city. I’m not sure what happened to the weather on that 15 minute ride but it went from a nice cloudy day to heavy rain. The rain was so heavy we had to walk around the train station for 30 minutes until it passed. Good thing the train station has over 50 tracks and plenty of shops. We didn’t spend much time in the city as the rain didn’t really let up much. The city does seem cute but it was very hard to take pictures hiding under an umbrella. We got our flight the next morning and had a smooth 17 hour journey home with a stop in Newark. Global entry and the TSA Pre were totally worth it as we got off the plane in Newark, through customs, picked up our suitcase and rechecked it, then back through security in 30 minutes. The line for customs would have taken more than 30 minutes. Thanks to everyone for their nice comments. I will be back in a little over a month from a new country with my parents. Here is a short video of the views of Alsace. There is always a vineyard in view and wine everywhere. I did find walking through the cute villages a little stressful when cars would drive right behind you. I’m sure the hot air balloon had a nice sunset view of the vineyards. Alsace is full of vineyards and picturesque villages. Storks come to this region for the summer. The villages are full of houses that are half made of timber. One of the main reasons for this type of structures is because it is easy to remove the top half of the house and move it when floods happen. It takes a day to move the top part of the house to a dry area and another day to set it back up. We spent an evening driving around to some of the different villages. I hear they are full of tourists during the day but it was sure quiet at night. You can actually walk or bike the wine route which would be a nice walk. We tried eating dinner in one of the villages but apparently their kitchen was closed and we could only order drinks. The guy who sculpted the Statue of Liberty was from Colmar, France. To honor the centennial anniversary of his death, a replica was created to honor him. It is 1/4 the size of the original. 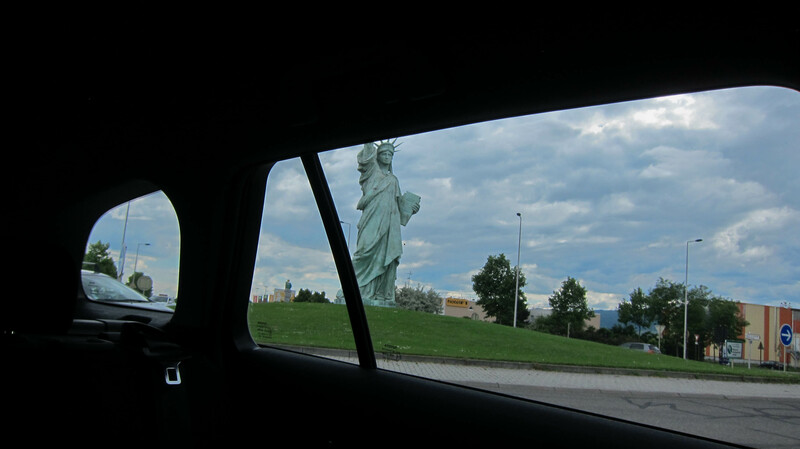 They put the statue in a middle of a busy roundabout, so it was pretty difficult to get a photo as we drove around the circle. Here is a very condensed version of the folk dance display that we watched. Colmar was a cute town to have as a base but after 4 nights there, I was ready to move on. It was pretty quiet there the first couple of nights but Thursday was a holiday and it seemed like everybody come to the town. It was full of people and harder to find a seat to eat meals. Colmar has little canals which are called Little Venice. They aren’t canals that I would want to go in but I guess boats really do go down them. People have to really duck when they go under the bridges. Every Tuesday night in Colmar during the summer months, they have a folk dance display with live music. It started at 8:30 PM and I was surprised when they ended shortly after 10. I enjoyed the music and dancing, but I think the 3 kids enjoyed the time a lot more. I think the hardest part of standing around so much was all the people smoking around us. My favorite part of the video is watching the bird go get food for the baby birds. We drove to Strasbourg, France which was about an hour from Colmar. The city was charming but definitely had more tourists than anywhere else we went on our trip. The cathedral had a lot of detail and the color was more of a red color which made it more unique than the other 100 churches we saw. We ate lunch which consisted of hot chocolate and a chocolate waffle. This place was recommended in one of the guide books so we decided to try it out. I’m pretty sure that was one of the biggest cups of hot chocolate I have ever seen. We took a very crowded long boat ride on the canals. It was a covered boat which didn’t make it great for taking pictures. I think half of the boat was full of kids that were on a school field trip. Hopefully they don’t have a quiz on what they saw because most of them were asleep. Since it was a larger city, I wanted to drive out of the city before people left work to go home. We went to pay at the machine at the garage before heading to our car but the ticket didn’t work. Luckily, there was a call button on the machine that called an employee down at the exit. He didn’t speak English and we couldn’t explain the issue in French so I had to explain to him in German that our ticket didn’t work. Somehow we got it all worked out in the end and he just guessed how much we owed. We were in Colmar for three full days. The first two days were busy going around to different cities and staying out late enough that I was too tired to update the blog. The third day we decided to stay around Colmar and I was going to update the blog. Sounded like a good plan until the internet decided to not work on the third day. Now we are in Zurich and the internet is too slow to upload any photos or videos. We fly home tomorrow so I will try to update the blog on Sunday when I have reliable internet again.